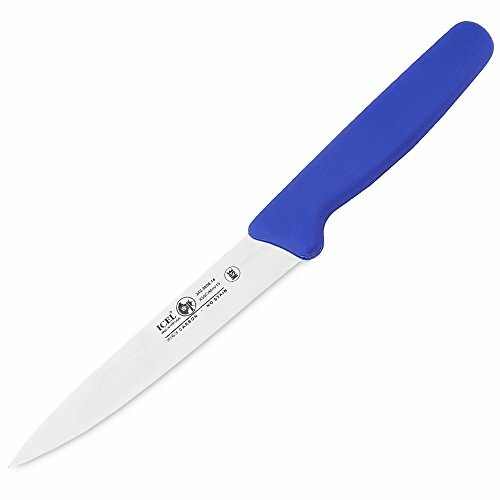 An all purpose basic kitchen wide stiff blade boning knife for separating bones from meat and fish, chopping vegetables and herbs *5 1/2-Inch Blade * 5-Inch Handle * Non-Serrated Blade * Blue Handle * High Carbon Stainless Steel * NSF Approved Icel Knives Brings You Excellent Knives. A special tempering process is used to produce an edge that can be resharpened over and over again, so the knife can keep its original sharpness throughout the entire life of the blade. Icel Knives Are Constantly Tested By The Commercial Food Service Industry. Icel Develops Knives With The Performance You Would Expect. The Blades Used In Icel Knives Are Formed From High Carbon Stainless Steel With Today's Best Cutlery Technology. Icel Knives Offer High Performance Cutting, Long Edge Retention, And Easy Re-Sharpening. And also Icel knives have a lifetime guarantee against faulty workmanship or defects in the material. Damages caused by misuse are not covered by this guarantee. Professional quality Boning knife. GREAT for all your HOLIDAY PREP NEEDS!!! The boning knife is ideal for separating meat, poultry, or fish from the bone with precise control. High carbon stainless-steel blade provides maximum sharpness and edge retention, Blue comfortable and slip resistant handle, designed for balance and comfort. Hand sharpened to assure a long-lasting cutting power and provide a professional quality in your Kitchen. Imported from Portugal, NSF-approved, Icel knives have a lifetime guarantee against faulty workmanship or defects in the material.